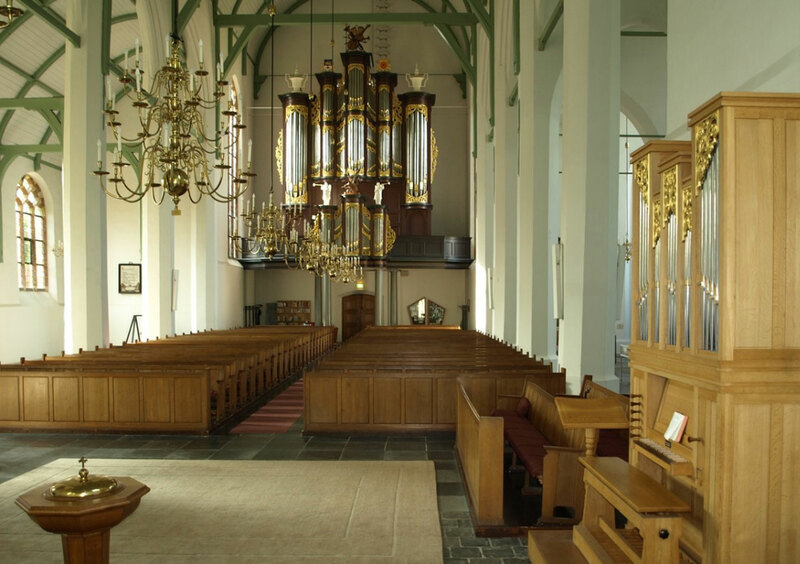 Collection Service for Cultural Heritage, Amersfoort, property no. 51.518 Oudheusden has been inhabited since the 8th century. At that time, there was mention of a fortified place, a "Castle," at the Oude Maasje. This castle, which bore the name 'Nieuwenrooy', stood on the site where the current public school 'Nieuwenrooy', was built. The church of Oudheusden after being destroyed several times since the French period was not rebuilt. Because the course of the Meuse is increasingly shifting northward, it already created in the 12th century the need to build a fortified place elsewhere. In the immediate vicinity of the castle the fortified town of Heusden established itself over the centuries. 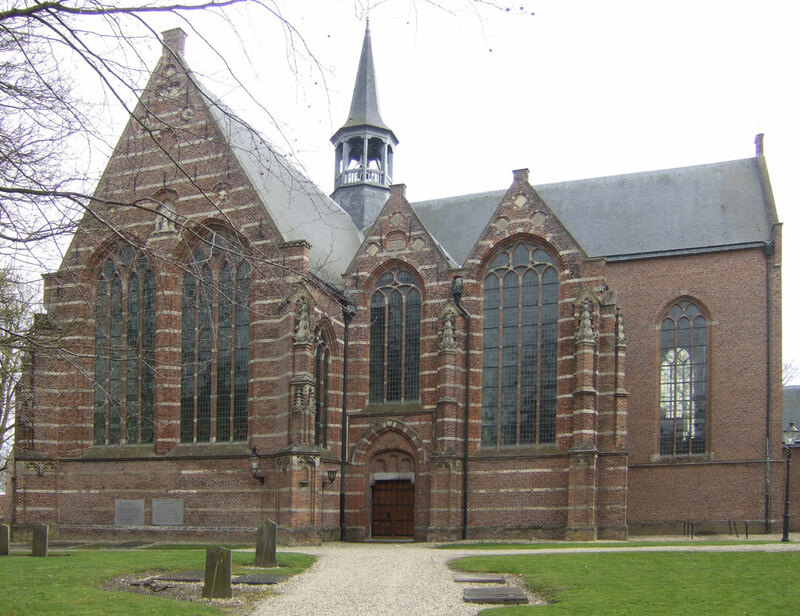 Already in the year 1210, mention is made of a church in Heusden. What the church looked like is not known. What was left, namely the tower built in Romanesque style, was destroyed in 1944. In 1328 the church was extended with a north and south aisle. There was also a choir in Gothic style. In 1555 a transept replaced the north aisle and three bays were constructed in alternating layers of brick and stone. Here we still find decorations in Gothic style. A city-wide fire in 1572 destroyed large parts of the church. Starting in 1579 a thorough restoration ensued. The side choir, probably built in 1412, was torn down in 1628. The location of this side choir is still visible in the masonry. In the years 1637-1639 the choir was renewed. The tower was blown up during the nights of November 4 to 5, 1944 by retreating German troops. The western part of the church was also destroyed. After the war, the church, on its west side, was closed in and restored. 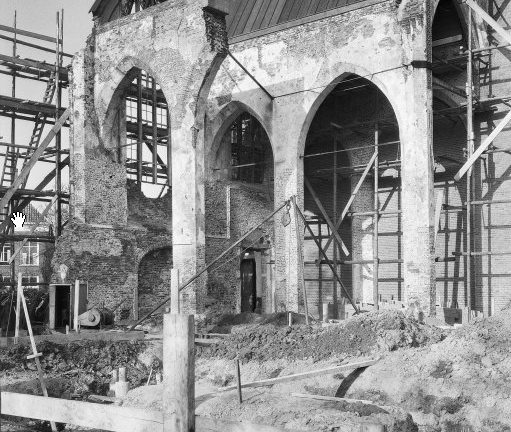 The tower, the western chapels and the devastated bays were not rebuilt. The circumference of the foundation is visible in the pavement. In the church one can find, in addition to beautiful gravestones and signs from the 16th and 17th centuries, bells from 1334, 1501 and 1518. A bell from 1412 now hangs in the turret. The mausoleum of the Baron Van Friesheim, Governor of Heusden from 1711-1733, dates from 1733 and is very beautiful. The design of this tomb is by Jacob Marot and the sculptor was Jan Baptist Xaverij. 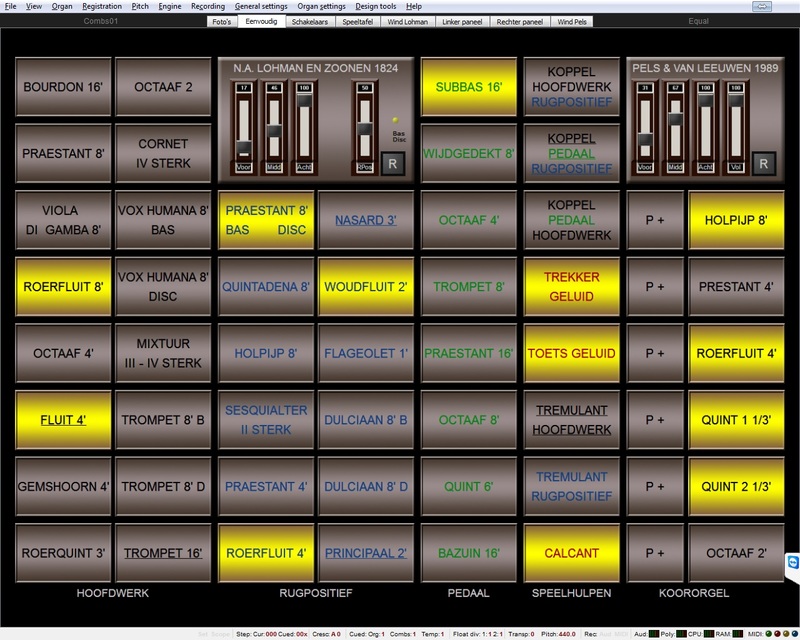 The padals on the real organ are fixed but to make it possible to play in Hauptwerk the Holpijp 8'; Prestant 4'; Roerfluit 4' and Octaaf 2' as a kind of transmission we have added a pedals to manual coupler. Also we have added a copy of the Subbas 16' from the Lohman orgel. 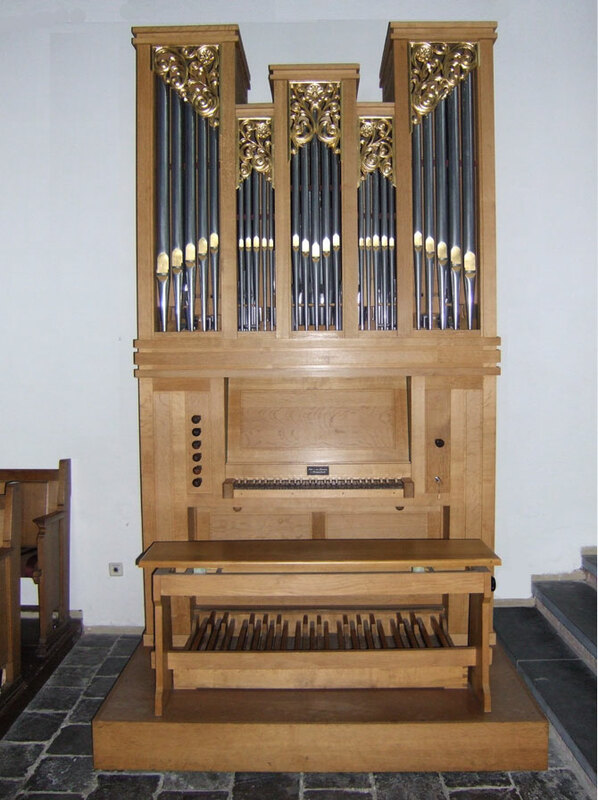 We have planned to make an ODF to join the Pels & van Leeuwen organ to the Lohman organ (using a fake 3th manual). So you can play both organs from one console. The most right column on the picture shows the stops of the positif. Using the "P +" buttons you can handle the transmissions (See above). 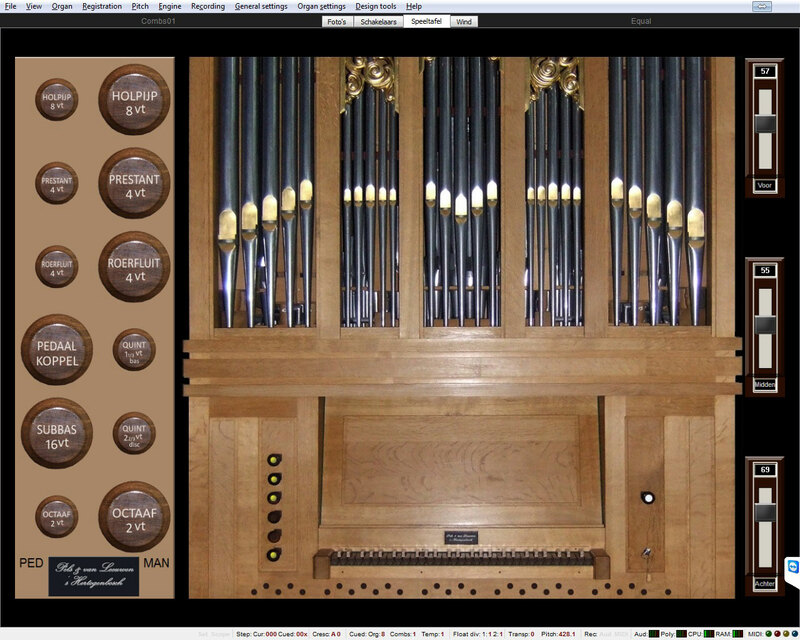 The 4th slider (with the caption "Vol") you can set the volume of the positif related to the main organ. Using the button "R" switches it back to the normal volume. Keep in mind: you have to load both organs on the same time in your memory to play the "join". The recordings for this sample set were made in January 2014. Number of samples processed in this set: 3954. Number of files in this set 4182 in 130 folders. Fred de Jong: Layout, ODF as well as customizing the website. and to Huib de Waal who as church warden was responsible for granting permission for recording.